Tomorrow is Veteran's Day, a day on which we honor all U.S. military veterans. Originally known as Armistice Day, which commemorated the end of fighting between the Allies and Germany on the 11th hour of the 11th day of the 11th month in 1918, its name and intent was changed by Congress in 1954 to honor all of our country's veterans. 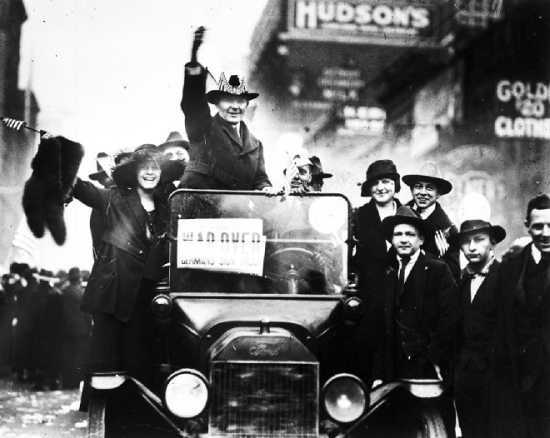 In recognition of all our veterans and especially those who were called "Detroit's Own", here is the little-known story of why, even though Detroiters celebrated on the original Armistice Day, they saved their real rejoicing for July 4, 1919. A big peace parade was to be held at three o'clock. Lawrence and I got a place up in Grand Circus Park. We were just across from the New Fyfe & Co.'s new building. On one corner is the Fyfe Building, across from it the M.E. Church, then on the same side as the church only on the other corner is the Madison Theatre building, across from the Madison is the David Whitney Bldg. Grand Circus Park is located between the four corners. About half past two someone shouted "There come the aeroplanes." We all looked up and there were four little specks in the sky. They kept getting nearer and finally we could see the men in the machines, they were so near. The four machines kept circling above our heads, diving and spinning and doing all the different tricks. There was one machine that was more daring than all the rest..... So daring did he become that the parade when it reached Grand Circus, came to a standstill and all eyes were turned upwards. Everybody was cheering and yelling..... The aviator came racing down Woodward Ave., as low as the tree tops..... The aviator intended to over up and over the Fyfe building. It seemed as though he would make it all right, when all of sudden there was a crash. The people turned away in horror, they knew what was coming. It was terrible. My God! I hope I shall never again see such a sight. It just made me sick. Everybody so happy and cheering and then that crash. The left wing of the machine had struck a rope fastened to the flagpole on the new Fyfe building. The machine wavered in mid-air for a few seconds and it seemed as though everything was all right. Then it turned and started on its wild dive to the earth. The aviator shut off his engine and the machine flew two blocks up Woodward and was over to the next street. Then it plunged through a two-story brick house. The house had a flat roof and the machine shot through to the second floor. The motor fell all the way to the basement. I was one of the first to get to the house, but thousands soon collected. They had to call the fire dept. to get the men out. The pilot, Lieut. Morrow was unconscious but he died a few minutes after being removed from the wreckage. The observer, a civilian by the name of Brown, was not killed and it is believed he will live...... It certainly was the most terrible thing I have ever seen and ever want to see. Lawrence and I left the house after the men had been removed and went back up town. The parade was all over so we went into the Miles Theatre..... After the show Lawrence and I walked around the town..... Such a crowd! People were dancing in the center of the street and celebrating in every possible manner. The Liberty Band had just finished playing and then they went over to Canada. Lawrence and I started for home about half past ten and at that time there was no sign of the crowds breaking up. I suppose they will celebrate all night. Well, it certainly has been a day for celebrating. After four years of war and then peace..... Well, I must close this wonderful and glorious day. And thanks be to God for sending us Peace again and may the sword never again be lifted unless it is in another right cause and there may we obtain victory in Liberty's name. Unbeknownst to the families of thousands of U.S. Army soldiers from Detroit and southeast Michigan, peace was not yet at hand for their boys, the ones the local newspapers had dubbed "Detroit's Own". There would be no victory obtained by their sons in Liberty's name and it would be another 235 days before they and their sons would experience any semblance of peace. 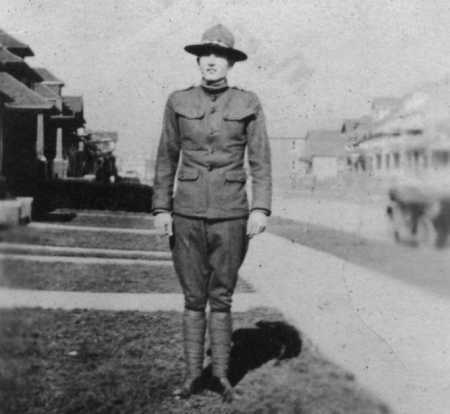 On that very same morning of November 11, 1918, the day when the slaughter on the Western Front ended with the Central Power's surrender to the Allied nations, Sergeant Silver K. Parrish was far from his home on Hastings Street in Detroit. 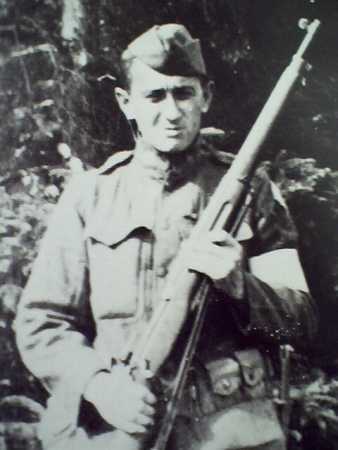 He and the rest of the men in Company B, which was part of the U.S. Army 's 339th Infantry Regiment, affectionately known as "Detroit's Own", had been sent in August 1918 to fight a different enemy 1,800 miles away from the Western Front in France. Sgt. Silver K. Parrish, Company B, 339th Infantry Regiment, a.k.a "Detroit's Own"
That morning at 8 a.m., Sgt. Parrish and his platoon had taken cover in a log blockhouse, where they were using their rifles and a single Vickers machine gun to defend a narrow wooden bridge on the outskirts of Toulgas, a small Russian village not far from the Arctic Circle. On the other side of the bridge and surrounding the town were 2,000 Bolshevik soldiers who were intent on wiping out the 600 American and Allied soldiers who were garrisoned in Toulgas. By the time the Battle of Toulgas was over on November 14th, the Bolsheviks had retreated and left 500 of their dead behind, at a cost of 28 Allied soldiers killed and another 70 wounded. Seven of the Allied dead were Americans, all members of Company B, including Privates Alek Pilarski and John Zajaczkowski of Detroit and Corporal John Savada of Hamtramck. Fantastic post Mikeg. A tip of the hat to all who served, and died , for the freedom we take for granted each day. Bless You. What was "Detroit's Own" doing in North Russia? North Russia map; rectangle encloses the general area where Allied forces fought the Bolsheviks. Students of history will recall that Imperial Russia was on the Allied side during the Great War and their Army engaged German forces on what was called the Eastern Front in Russia and the Ukraine. In March 1917, the Russian Czar Nicholas II abdicated the throne and was replaced by a provisional democratic form of government, which pledged to continue fighting the Germans on the Eastern Front. However, the ill-fated Russian offensive of June 18, 1917 eventually stalled and their poorly-equipped Army was overwhelmed in the resulting German counteroffensive. This was the end of fighting on the Eastern Front, and the war materiel being supplied by the Allies quickly began piling up in the north Russian ports of Archangel and Murmansk. In October 1917, Vladimir Lenin and Leon Trotsky led a revolution that overthrew the provisional government and placed the Soviet communists in power. They eventually negotiated the Treaty of Brest-Litovsk with the Germans which formally ended the war on the Eastern Front in March of 1918. The spring of 1918 found the Allies in need of a new strategy. With no Eastern Front, the Germans could now redeploy their troops to the Western Front. The elite Czech Legion, which had been fighting the Germans alongside the Czar’s troops, had withdrawn to the interior of Russia along the Trans-Siberian railroad and was being prevented by the Soviets from making their way to the Western Front via Vladivostok in the Far East. The Soviets were expanding their control to the outlying provinces of Russia and their Bolshevik Red Army was growing in strength. transporting the strung-out Czech Legion to Kotlas, so that with combined forces, they could take on and defeat the Bolshevik army, drive the Soviets from power and resurrect the Eastern Front. It was on the basis of these ambitious plans that the British and French leaders convinced a reluctant President Wilson on July 23, 1918 to commit troops to Russia. Highly dubious of the chances of recreating an Eastern Front, Wilson nonetheless agreed to commit about 5,000 U.S. soldiers, but only to guard the war materiel in Archangel. The 339th regiment from Camp Custer arrived in town yesterday morning. This regiment is the first bunch of drafted men that left Detroit last fall. It is a fine regiment of soldiers and fit to beat the Kaiser any day. They gave a drill at the Armory last night and will give another tonight after which they will return to Camp Custer. I had intended to go down to see them but all the tickets were sold and you couldn't get to within a block of the Armory. On July 14, 1918, the men of the 85th Division began boarding special troop trains bound for New York City, where a week later they boarded troop transport ships which took them to Liverpool, England. The troops disembarked on August 4th and were sent by train to camps near London for additional training prior to heading for the Western Front in France - or so they thought. General John J. Pershing, the commander of all American forces in Europe, had just received the July 23rd directive from President Wilson and decided to change the orders for the 339th Infantry Regiment, the 1st Battalion of the 310th Engineers, the 337th Field Hospital and the 337th Ambulance Company. Instead of continuing to the Western Front with the rest of their 85th Division counterparts, these units were designated to be re-equipped and re-trained before joining the British and French Allies in Archangel as the American North Russia Expeditionary Force (ANREF). After three weeks of training, on August 25, 1918, the ANREF boarded trains for Newcastle-on-Tyne, where three troop transport ships were waiting to take all 5,000 of them straight into the middle of the Allied Intervention in the Russian Civil War. the statue at White Chapel cemetery. Their voyage to Archangel was relatively uneventful, at least with respect to enemy U-boats and the weather. However, by the fifth day at sea, every available bed on two of the ships were occupied by soldiers who had contracted Spanish Influenza. Many others who were also infected but had a lesser fever were confined to their hammocks or laid about on deck. The ships arrived in Archangel on September 4th, and it took two more days to negotiate and prepare hospitals on shore before the approximately 175 seriously ill men could be debarked. The first death came within hours after they were brought ashore on September 6th and by the end of that month a total of 63 American soldiers had died from the "flu". The rest of the 5,000 enlisted men and officers who were deemed fit for duty disembarked between September 5th and 7th. They were immediately placed under British command and joined some 6,300 Canadian and British soldiers plus about 1,600 French troops who were either already in the Archangel region or well on their way. The first thing that the Americans discovered after landing was that there was no war material to be guarded since the Bolsheviks had taken all of the militarily important supplies with them when they evacuated Archangel in advance of the British landings in August. The second thing they discovered was that their British commanders immediately ordered them into battle, with orders to engage and chase the Bosheviks to the south along the Dvina River and Vologda Railroad Fronts. One of the first of "Detroit's Own" to die in battle was Corporal Morris J. Foley of Detroit, who was killed on September 20th at the battle of Seltso. Cpl. 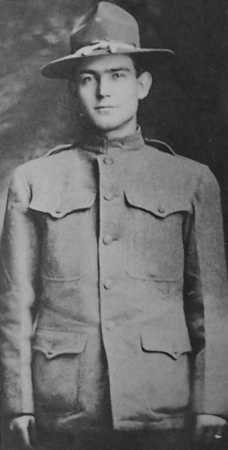 Morris J. Foley, Co. B, 339th Inf. Reg. is shown while home on leave, Detroit, MI, 1918. By mid-October, winter weather was beginning to settle in and the offensive had bogged down far short of their objectives. By then, the Communist leaders and military commanders had come to realize that their forces far outnumbered the Allied troops and that the winter weather and numbers were on their side. The British commanders finally came to that same realization and gave orders to adopt a defensive posture along all the Fronts. 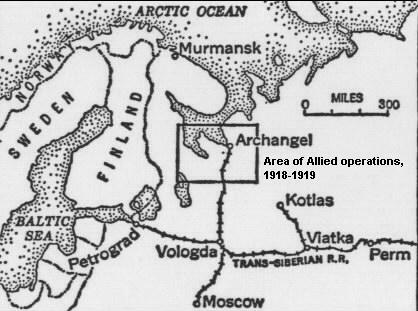 The Bolshevik attack on the Allied garrison at Toulgas on November 11th reflected the change in momentum. And since the Bolsheviks had signed a peace treaty with the Germans, they felt no obligation to stop fighting the foreign troops who had landed on Russian soil and were fighting on the side of their White Russian opponents in the Russian Civil War. The ANREF and their Allies now found themselves having to continually defend their scattered outposts against attacks by large numbers of Bolshevik troops. Only the American's superior machine gun firepower and the Canadian's skillful artillery barrages kept them from getting overwhelmed by the Bosheviks. 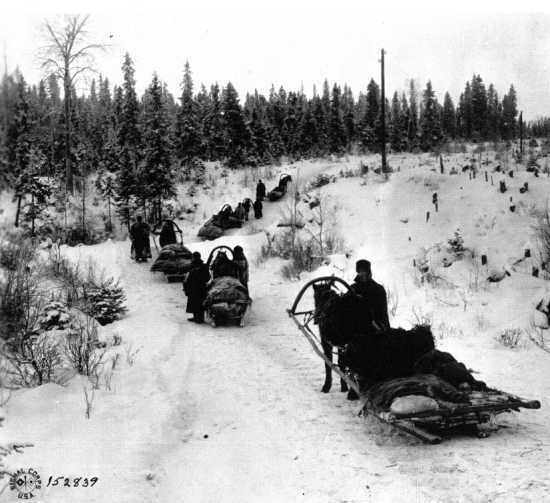 Temperatures during the winter months regularly dropped to 40 degrees below zero Fahrenheit and some of the wounded would die not from their injuries but from freezing to death before they could be evacuated during the fighting. Eventually, more than 240 American soldiers would die in North Russia from battle, accidents and disease. During the long cold months with nights that were 20 hours long, morale plummeted and threats of mutiny occasionally surfaced. Yet, when it mattered most, the Americans fought bravely - not only as a matter of duty, but also for their own survival. During the course of the North Russia campaign, nineteen of "Detroit's Own" would be honored with the Army's second highest award for valor, the Distinguished Service Cross. Meanwhile, back home in Detroit and elsewhere in Michigan, parents were reading the heavily-censored letters from their sons and asking the questions no one could seem to answer - Why are our sons still fighting months after the signing of the Armistice - and under British command? Why had President Wilson sent them to Russia? When were they coming home? They wrote letters to their home-town newspapers and to their Congressman and circulated petitions demanding that they be brought home. The Detroit newspapers began editorializing and Senators began "speechifying" and finally in February 1919, the Army announced that the ANREF would be withdrawn from Russia at the earliest possible time, which at that sub-Arctic latitude meant very late Spring. 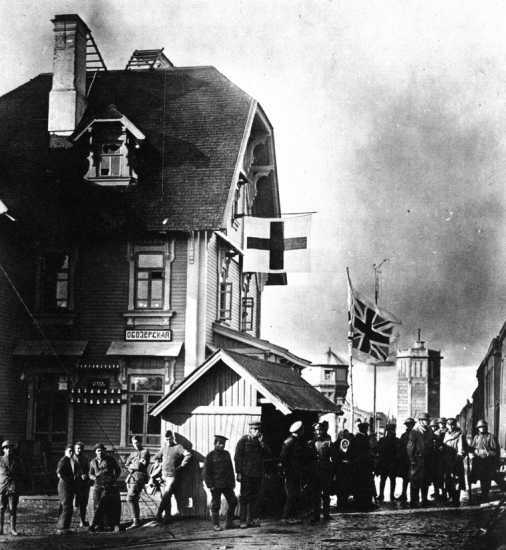 In late May 1919, the ANREF was replaced by the British North Russia Relief Force and they began leaving Archangel during the first week of June. They spent two weeks in Brest, France on the way back, getting de-loused and receiving new uniforms and equipment. It was while they were on their way home that the men of the ANREF adopted the nickname "Polar Bears" to reflect their wintertime service in the frozen wilds of Russia. c) "Detroit's Own" Polar Bear Memorial Association. Great read and I look forward to reading the rest. I was at White Chapel about two weeks ago to see the Polar Bear memorial. Great thread, Mike, and most timely. Thanks. It was the city's show of sympathy for the only American troops for whom the Armistice signing meant nothing..... There were to be no formalities that tired without pleasing, no parades that delighted only the spectators, no ceremonies to bore those for which they are intended. The plans provide that the welcomed should be entertained, not the welcomers. The first section of men from the 339th to arrive back in Detroit rolled into Michigan Central Station at noon on Thursday, July 3, 1919. Three more troop trains arrived later that day at 7:30 PM, 8:30 PM and 11:00 PM, each bringing large numbers of 339th soldiers home from Camp Merritt, NJ. Welcome Home to the Polar Bear Regiment! You will be able to rejoin your relatives in your Company tents at the foot of Belle Isle when the parade disbands after the presentations to Maj. Nichols. Men from out of town whose relatives are not present will be served much ice cream and chicken at the red Cross picnic grove directly opposite the Casino, beginning at 11:30AM. Men whose relatives have provided lunch are asked to picnic in the space set aside for the Detroit's Own Welfare Association, just north of the Casino and across the canal. The Belle Isle bathhouse master will provide swim suits at all hours for the 339th men. The Detroit Boat Club and Detroit Yacht Club will extend all privileges. Men wanting to get back to the mainland during the day may take the launches of either these clubs from the club dock. Baseball game at 3:30PM between teams of Machine Gun Company at Belle Isle Diamond No. 1. Prizes of silver cigarette cases. Senator Johnson will speak from the Casino balcony at 2:00PM. 339th men are asked to assemble at Company tents and march to reserved space. Jazz band will furnish music for dancing on green at foot of Island, beginning at 2:30 PM. Seven band concerts at various points on Island. ASK ANY COMMITTEE MAN WITH 339TH BADGE FOR ANYTHING IN THE WORLD, EXCEPT A MARRIAGE LICENSE. On Friday July 4th at 8:00AM, the men of the 339th gathered on the Detroit riverfront [photo] to board the ferry Brittania for the short trip upriver to the dock on the Canadian channel side of Belle Isle. The Welcoming Committee distributed white "Polar Bear" armbands to every soldier, which they wore proudly during their day on the Island. 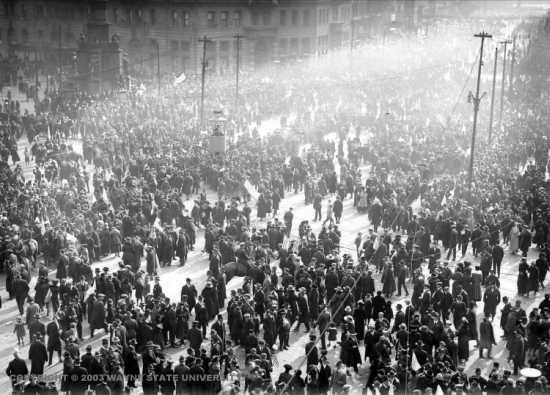 Belle Isle was already teeming with thousands of people [photo] and 100 rockets were launched into the air as the Brittania approached. Girls dressed in white Red Cross uniforms [photo] lined the pier and tossed flowers as the men disembarked [photo]. They marched directly to the athletic field [photo], where they were permitted to meet friends and family. After a short time, they lined up [photo] again to parade down Central Avenue [photo] in front of thousands of relatives, friends and ordinary citizens. Arriving back at the quadrangle at the foot of the Island, they were told by Maj. Nichols to return to their Company Tents [photo], have fun [photo], enjoy the rest of the day and do whatever they wanted, just as long as they were at the Michigan Central Station by 8:00 AM the next day. On Saturday morning, the first troop trains departed at 9:00 AM sharp for Camp Custer near Battle Creek, where the men would be mustered out of the Army during the following week and sent home to resume their civilian lives. 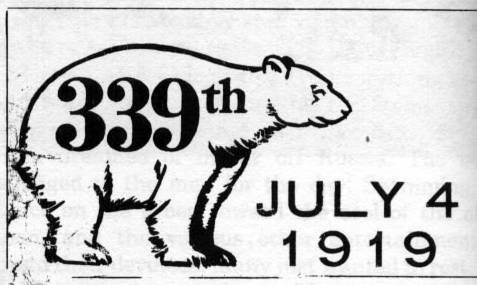 In 1920, the ANREF veterans organized the Polar Bear Association, and made it a primary objective to bring back home the remains of their fallen "brothers" who were still buried in Russian soil. 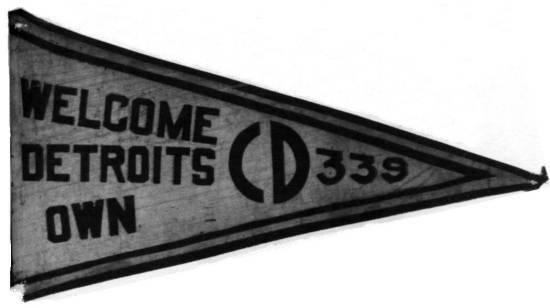 In 1929, the State of Michigan appropriated funds and the Governor appointed a committee which traveled to North Russia and brought back the remains of 85 American soldiers. The graves of another two dozen soldiers could not be located and their remains still rest in the permafrost of the North Russian forests. 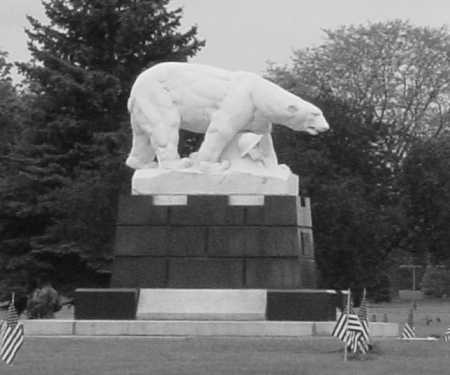 On Memorial Day, May 30, 1930, the Polar Bear Association dedicated the Polar Bear Monument at White Chapel Cemetery in Troy, Michigan and solemnly reburied alongside it the remains of 45 of their comrades that had been brought back from Russia. Every Memorial Day for the next 53 years, their Association held a memorial service at the Polar Bear Monument to honor their fallen. That tradition is carried on today by a successor group, the Polar Bear Memorial Association, which conducts a service every Memorial Day at 11:00 AM at the Monument, to which the public is invited. Interesting, I've read about the Polar Bear Expedition before, but I can't be sure it wasn't also here from Mikeg. My grandfather was a "Polar Bear" and is buried by the statue at White Chapel cemetery. Is he shown on this diagram of those who were buried alongside the Monument on May 30, 1930? Is his name listed on the Bentley Library's web site? My grandfather, Co. I, 339th Infantry Regiment, Belle Isle, July 4, 1919 (note the white armband). Yes, it was written in 1958 by E.M. Halliday under the title "The Ignorant Armies". My grandfather and most of the other "Polar Bears" disliked the title because they were afraid that the public would think that they were ignorant soldiers. Of course, by "ignorant", Halliday was referring to the fact that they and the American public were never given an explanation as to why they were sent to fight the Communists in North Russia. This book is now back in print under the new title "When Hell Froze Over". I have more books on the subject of the "Polar Bears" listed here. 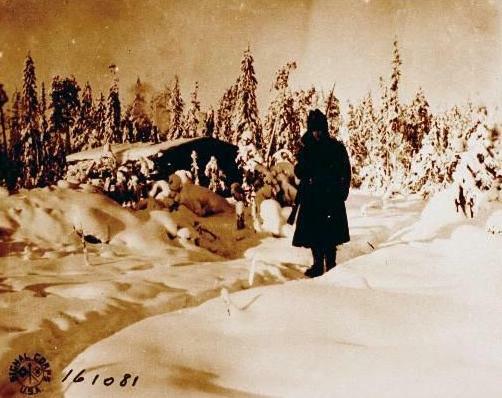 How cold did it get in North Russia during the winter of 1918-1919? Soldiers who were on sentry duty in the middle of the frigid night would sometimes be startled by what sounded like the crack of a rifle shot. However, the noise would turn out to have come from a tree limb which had shattered into splinters due to the extreme cold that regularly reached 20 to 40 degrees F below zero. Blockhouse at Verst 455 surrounded by the forest, white with a new covering of snow. The picture was taken on one of the coldest days of the year when the temperature reached a point fifty degrees below zero. The American soldier in the foreground is Corp. Hearn of Company I, 339th Inf. 85th Division. Verst 455, Vologda Railway Front, Russia, February 17, 1919. 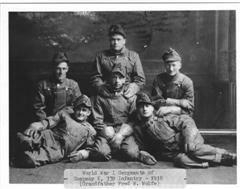 That was the official caption accompanying US Signal Corps photo no. 161081. A Verst is a Russian unit of measurement, equal to approximately 0.62 mile. "Verst 455" was a railroad siding located at "verst marker" 455. This was the location of the Allied HQ on the Railroad Front and it was only 11 Versts to the north of the Bolshevik front lines (just beyond the range of the Russian artillery). Custer Division! Talk about the kiss of death. A page in our history that got hush-hushed out of the history books. Would have happened with the "Blackhawk Down" and My Lai" incidents , among others, if it weren`t for the mass media coverage. My grandfather was Fred W. Wolfe and is listed on your site. He passed around 1950,and he and his wife's grave are a stones throw from the monument. He was a billboard and sign artist in Detroit for most of his career. I'll try to scare up a photo I have of him in uniform from that era. Post it,or send to you? That would be great! Please send it to me using this contact information. Include whatever additional information you have about him. If you can handle it, feel free to add it to this thread, otherwise I can add it for you. over Romania and eastern Europe. My brother was a SeaBee stationed at Binh Thuy, South Vietnam. I was stationed on the USS Reasoner FF-1063 Westpac. (cold war). You have the rest of the photos. 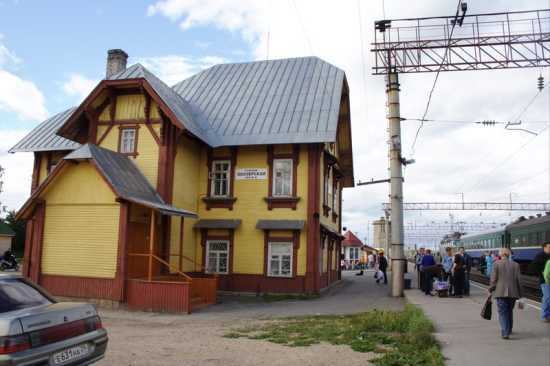 The railway station in the town of Obozerskaya was used as a Red Cross hospital for Allied troops on the Railroad Front. 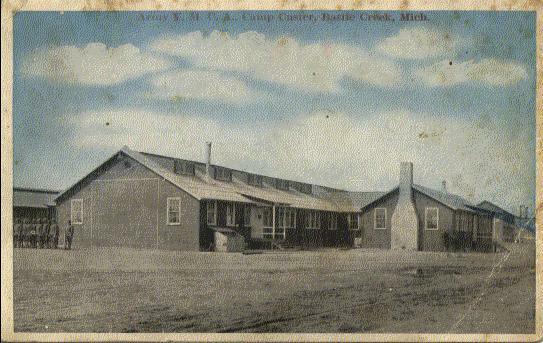 This photo of the station was taken on Sept. 21, 1918. The railway station as it appeared on Aug. 12, 2007. Over the past 89 years, the station has undergone a few cosmetic changes and the railway electrification equipment has been added. The railroad water/coaling tower is visible in the distance in both photos. My e-mails to you are getting returned as "Could not deliver message - system error: The parameter is incorrect". If you could, please visit this page and tell me as much as you can about each photo and those who are in it (names, dates, places, etc.). All done before- but will keep this thread alive for other posters. God bless the Polar Bears. In the late 40's I was in St.Francis Military Home for Boys on Linwood & Fenkell. Every summer they would treat all of us to a "train" ride and Eskimo pies among other things. It was a special day when they came to the campus. I remember those great days fondly.